You read a news story about a vicious attack on a helpless victim by a bat-wielding assailant. Of course, you’re horrified. But just how horrified are you? It depends on who the victim is, according to a study published in the journal Society & Animals. Researchers gave 240 students from Northeastern University four fictional news stories. Each described a police report about an attack “With a baseball bat by an unknown assailant.” The stories continued: “Arriving on the scene a few minutes after the attack, the police officer found the victim with one broken leg, multiple lacerations, and unconscious. Here’s the twist: the victim changed in each story. Depending on the version, the victim was a one-year-old baby, a man in his 30s, a puppy, or a six-year-old dog. After the students read the stories, researchers asked them to describe their emotions, using a standard set of questions designed to measure empathy. The students who read the report where the victim was a child, dog or puppy all expressed similar levels of empathy. The guy in his 30s didn’t get nearly the same love. This didn’t come as a big surprise to the researchers. “We hypothesized that the vulnerability of victims—determined by their age and not species—would determine participants levels of distress and concern,” they wrote. In other words, researchers expected people to be more upset when the victim was younger—a baby or a puppy—than when the victim was older. The Northeastern study seems to back up the results of a similar experiment conducted two years ago in the United Kingdom. 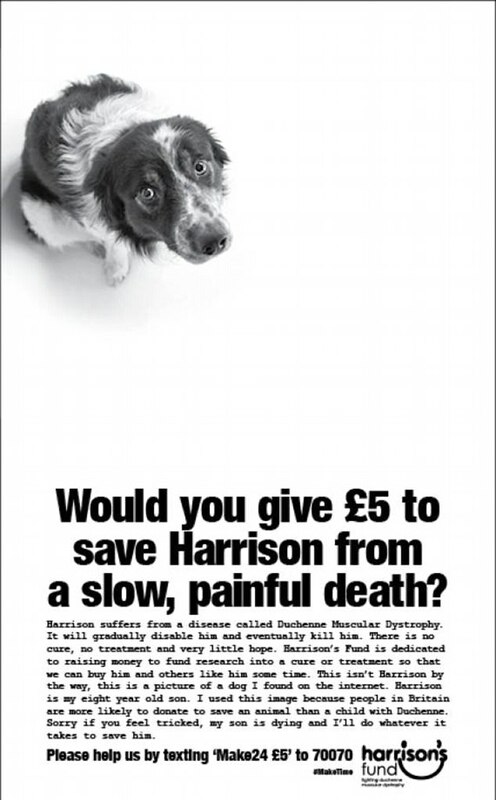 The twist this time: In one of the ads, Harrison was a human boy. In the other he was a dog. Guess who got more clicks? If you picked the dog, you’re right. That ad got twice as many clicks as the one with the boy. Second, that feelings of empathy may be related to the perceived helplessness of the victim: "It appears that adult humans are viewed as capable of protecting themselves, while full-grown dogs are just seen as larger puppies," Levin said. Either way, when it comes to getting empathy, dogs and babies have the edge.